Heat oven broiler. Line baking sheet with foil. Spread ½ teaspoon mayonnaise on each slice of bread; place bread mayo side-up on baking sheet. Broil 5 minutes until toasts are golden brown. Transfer to serving plate. 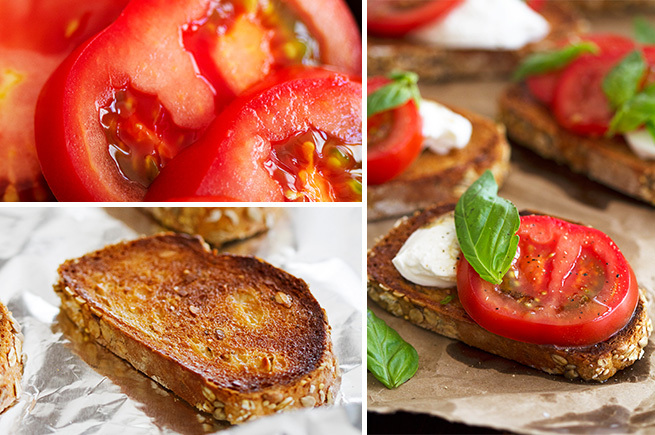 Top each slice with 1 piece burrata cheese and 1 to 2 slices tomato. In small saucepan over medium-low heat, melt butter. Continue to cook butter after melting, stirring constantly, until butter smells nutty and turns deep brown color. Immediately remove from heat. Drizzle brown butter over toasts. Top toasts with fresh basil leaves, salt and pepper. Serve immediately. Recipe Courtesy of: Stephanie Wise of Girl Versus Dough.